A new e-ink display means that the Yoga Book C930's secondary screen is a keyboard, notepad, and e-reader, all in one. Though Asus may have relaunched the concept of a dual-display computer with Project Precog, Lenovo began commercializing the idea in 2016 with the original Yoga Book. Now Lenovo has refined the concept with the Yoga Book C930 it launched Thursday at the IFA show in Berlin, Germany, boasting several usability improvements over the original. The Yoga Book C930 does away with a traditional keyboard, replacing it with a matte e-ink screen that doubles as a writing pad for the included stylus. It’s a niche product, but one that’s specialized for digital artists and others who prefer inking with a pen. Beginning in October, the Lenovo will ship the Yoga Book C930, priced starting at $999—considerably more expensive than the $579 price Lenovo currently charges for the original Yoga Book. For the extra price, though, you get a larger 10.8-inch display, and either a Core m3 or even a Core i5—a considerable improvement over the original Yoga Book’s Atom processor. You can even use the bottom display as an e-reader, thanks to the updated e-ink screen. The lower e-ink display on the Lenovo Yoga Book C930 is optimized for inking. Though it’s certainly possible to open a thin ultrabook or tablet from a closed position, there’s one nifty feature that Lenovo has added: “Knock to open,” which allows you to tap the top center of the C930 when in a closed position. Doing so causes the C930 to spring open slightly, allowing you to crook a finger under the lid and continue opening it. Once inside, you’ll have a chance to take advantage of the C930’s signature feature: its second screen. 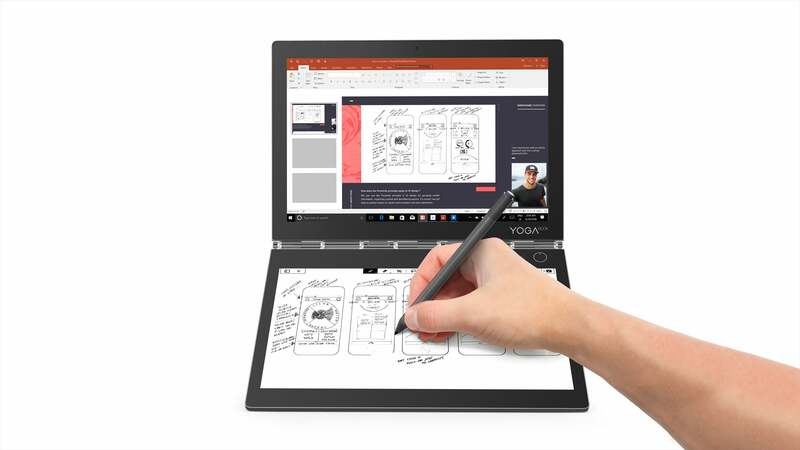 The original Yoga Book was aimed at consumers who enjoyed drawing, and the included pen even allowed you to swap the stylus nib out for one with actual, physical ink inside. You could then put a piece of paper over the base to add realism to the inking experience. The C930 does away with all that, simply reserving the lower display for e-ink input. 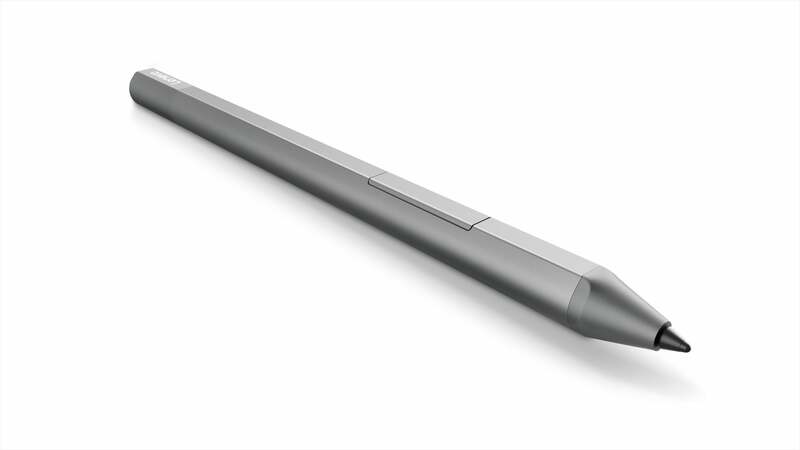 A closer look at the included Wacom pen. But that’s not all! Not only can you write on either screen, but Lenovo says that you can use the e-ink screen as a PDF reader as well. The advantage here is that by displaying it on the e-ink screen, as opposed to the traditional LCD display, the C930 saves battery power. When not in use as a display, the lower e-ink screen doubles as a keyboard, and Lenovo has made improvements here as well. While the screen still projects a backlit "keyboard" onto the matte surface of the e-ink display, Lenovo has added slight isometric gradients to simulate the appearance of three-dimensional keys. Even better, the keys slightly animate, vibrate, and sound when tapped, giving visual, tactile, and aural feedback that they were depressed. Even the virtual trackpad can be toggled on and off for additional space. You’ll still have the same basic impression of typing on glass, but Lenovo seems to have done everything possible to fool your fingers into thinking they’re typing on a more traditional keyboard. Don’t confuse the Yoga Book C930 with the separate Yoga C930—they’re two entirely different devices, and the latter is a traditional laptop. 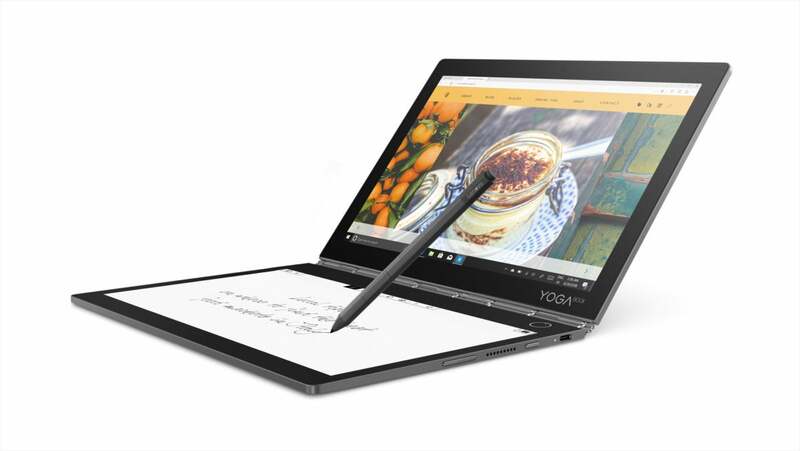 But if you’re looking for a specialized take on the traditional tablet, you might want to check out the new Yoga Book C930.